Product Overview The CORSAIR HD120 RGB LED high performance PC case fans combine excellent air delivery with individually controlled RGB LED lighting. By utilizing ultra-thin fan blades and PWM control the HD120 RGB LED fans are custom designed to deliver air directly to high-temperature components with less noise and turbulence than ordinary fans. Under control of an intuitive three button controller (not included, available in full kits), the 12 independent RGB LEDs and 7 unique lighting modes ensures a wide array of customization and vivid lighting effects. The CORSAIR HD120 RGB LED fans are tailor-made for those seeking excellent airflow, quiet operation, and powerful lighting. Features • Independent RGB LED lighting: Each of the 12 RGB LEDs, built directly into the fan frame, are independent, unlocking unique customization and lighting effects. • Intuitive 3-button controller (Not included, available in full kits): Allows you to cycle through lighting effects, effect speeds, and colours. • PWM Control: 800 -1725 PWM rpm control range. • High static pressure: Provides improved performance over standard case fans. • Quiet performance: Ultra-thin fan blades ensure less vibration, noise and turbulence. • Two year warranty: Your guarantee of reliable operation. • HD120 RGB LED 120mm High Static Pressure Fan. Please note: This product is intended as an expansion of CORSAIR’s HD120 RGB LED fan kits that include the RGB LED hub and controller. 120mm Corsair HD120 RGB LED, 9 Blade, PWM, Static Pressure 12 LED Multi-Colour Single Fan Expansion Pack, 4-pin is rated 5.0 out of 5 by 1. Rated 5 out of 5 by aich69 from For the RGB lovers Bright, quiet and effective. I have just replaced red LED Corsair ML fans with these [6 in total] and they are just as quiet and effective in cooling. Configured through the controller hub that comes with the kit of three [or the single fan kit] they are easy to match up with any existing lighting you might have, the colours seem true to my Phanteks LED strips for example. 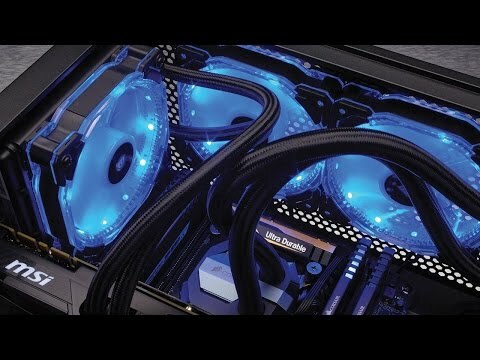 Each fan has two cables; one 4 pin PWM to connect to your motherboard and one cable to connect to the hub to control the colour, lighting mode and colour/mode speed of the fan.